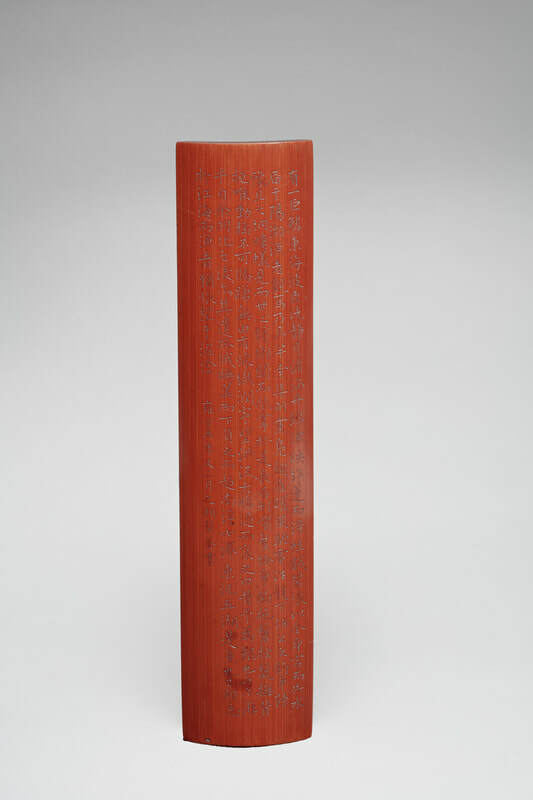 A curved bamboo wrist rest with a lightly incised calligraphy poem, signed and dated “Bo’an on the first day of the third month of the fifth year of Yongzheng’s reign,” corresponding to 1727. The reverse is carefully polished. China. Qing dynasty, Yongzheng period, dated 1727. John C. Weber Collection, New York from 1995 to 2018. There is a gigantic fish [living] in the Eastern Sea. [It]cleanses [itself] in the moonlit riverside and immerses [itself] in the sunlit water reddened by the glow of the sun. [It] reflects [itself] in the red lotus so as to cultivate [its] disposition and plays in the green waves to develop [its] body. [Once, the fish] loafed around and left the water, and arrived at the northern shore [of the Eastern Sea]. A fisherman saw [the fish], then he prepared rods and lines and assembled his companions. [They were exuberant like] waddling ducks and hopping sparrows, heading towards [the fish] as swiftly as the wind and lightning. They competed to cast fishing lines [with livestock as baits], as Rengong did[to catch a big fish],1and to set up fishing nets as Yuqie did [to capture an immortal turtle].2Mole crickets and ants were gleeful when they saw this, and otters clapped their hands when they heard about this. Hence, [the mole crickets and the otters] stretched their tongues and sharpened their mouths [while the fishermen] dragged the fishing lines and scrambled for the hooks; hauled and chopped off the fins of the fish; squeezed its back and strangled its throat. Thus, the fish was unable to move or jump. “[I would revive] with a small amount of water. How can I get [ back to] the mighty torrent?”3The enormous bird Peng flew past and pitied the fish: “When I was the enormous fish Kun,4I swam with you! After I was transformed [into a bird], you were left alone.” All of a sudden, [Peng] flapped his wings and flew quickly away, carrying the fish [on its back]. They floated southwards across the seven marshes [of the Kingdom of Chu] and eastwards over the five lakes [near Yangzhou]. The fish [was finally back to the water, and the two friends] have already forgotten each other in the river and sea.5Whereas, the fishermen were still [standing] in the mire, sullenly gazing [into the water]. 1The fishing story of Rengong is recorded in the section of “External Things” in “Miscellaneous Chapters” of the book Zhuangzi(《莊子•雜篇•外物》). 2The story of Yuqie capturing an immortal turtle is also recorded in “External Things”in Zhuangzi(《莊子•外物》). 3The two sentences 有懷纖潤，寧望洪流? derive from a story concerning Master Zhuang and an official who supervises rivers, recorded in “External Things”in Zhuangzi(《莊子•外物》). Zhuang compares himself to a dying carp to criticize the stingy official, who made an empty promise. 4Peng is a giant bird transformed from the giant fish Kun in Chinese mythology. The legend is recorded in the section “Free and Easy Wandering” in the book Zhuangzi(《莊子•逍遙遊》). 5This sentence is derived from the story of two dying fish in the section “The Movements of Heaven” in “Great Ancestral Masters” of the book Zhuangzi(《莊子•大宗師•天運》). “Have forgotten each other in the river and sea/lake” means the dying fish has survivedand is busy living life.